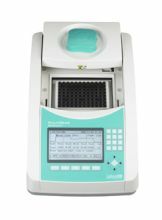 Labnet's MultiGene Gradient Thermal Cycler produces consistent, reliable results while making gradient technology affordable. This unit is extremely simple to program, compact in design and built to perform. PRECISION THERMAL CONTROL - Rapid heating and cooling of the precision machined sample block is achieved by six Peltier modules. Temperature sensors across the block feed data to the microprocessor to control operation of the system and ensure accuracy and uniformity. Two types of temperature control are selectable. The first option is block control, which uses the actual temperature of the block to adjust heating and cooling input. THe second option is tube control, which uses a sophisticated algorithm program that calculates sample temperature based on volume and triggers heating and cooling accordingly to provide quick temperature change in the sample and minimize over- and undershoot. EASY PROGRAMMING - Programming the MultiGene Gradient thermal cycler is very intuitive. The large, backlit LCD displays alphanumeric characters and a graphical representation of program steps. Simple, on-screen instructions guide the user through the programming process. The MultiGene Gradient is provided with common pre-programmed protocols which are easily edited by navigating to the appropriate parameter with the arrow keys and entering a new value. A maximum of 99 programs may be stored in the system memory and organized in public folders or user folders, which can be password protected. 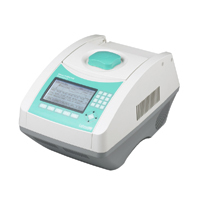 PROGRAMMING FEATURES - A variety of applications can be performed with the MultiGene Gradient thermal cycler, from single temperature soaks to sophisticated multistep programs. All of these are easily set up. Time or temperature of a cycling step can be automatically increased or decreased during successive cycles. This is useful for "touchdown" applications and extending annealing times as enzyme is depleted. Programs may also be paused while running. During operation, actual times and temperatures are displayed. Estimated run times are automatically calculated and a log of the last run can be displayed or downloaded to a PC. 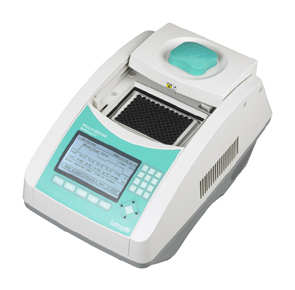 SLIDING, ADJUSTABLE HEATED LID - The heated lid, a standard feature of the MultiGene Gradient thermal cycler, is fully adjustable to provide the proper pressure for use with different height tubes as well as plates. A compression mat is provided to ensure even pressure when using plates. For optimum performance, temperature of the lid may be programmed. To ensure that users never come in contact with the hot surface, the lid slides back and away from the samples. In addition to eliminating the risk of burns, this also provides complete access to samples. The lid can also be flipped up for cleaning. 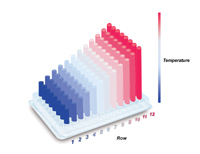 GRADIENT CAPABILITY - The MultiGene Gradient thermal cycler block can be programmed to operate with uniform temperature across the block for consistent results, or with a temperature gradient for protocol optimization. 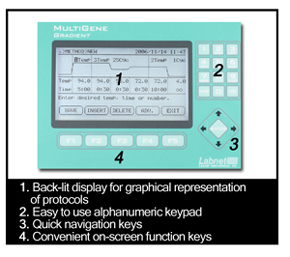 The MultiGene's gradient is spread horizontally allowing twelve temperatures to be evaluated simultaneously. To program a gradient, the high and low temperature are set, and the software automatically calculates and displays the temperature in each row. A maximum spread of 24ºC can be set up across the block.